The Feast of Corpus Christi, which is Latin for “Body of Christ”, is a Latin Rite Liturgical Solemnity, celebrating the tradition and belief in the Body and Blood of Jesus Christ, and his “Real Presence” in the Eucharist. 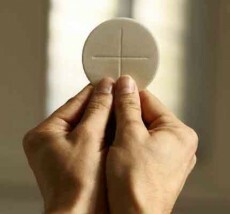 It emphasizes the joy of the institution of the Eucharist, which was observed on Holy Thursday. In the Roman Missal, the feast is designated as the “Solemnity of the Most Holy Body and Blood of Christ”. The feast day is Liturgically celebrated on the Thursday after Trinity Sunday, and is generally assigned to the Sunday after the Most Holy Trinity. At the end of the Holy Mass, there is often a procession of the Blessed Sacrament displayed in a Monstrance. The procession is followed by Benediction of the Blessed Sacrament. The earliest possible Thursday celebration falls on May 21st, and the latest could be on June 24th, always falling on the Thursday after Holy Trinity, and generally moved to the following Sunday. The celebration became wide spread after the death of St. Juliana, a 13th century saint who had a special veneration for the Blessed Sacrament, and longed for a feast day outside of Lent in its honor. She had a vision of a full moon having one dark spot, which signified the absence of such a solemnity. In 1208, she had her first vision of Christ in which she was instructed to plead for the institution of the Feast of Corpus Christi. The vision was repeated for the next 20 years, but she kept it a secret. When she eventually told her confessor, he relayed it to the Bishop. In 1264, Pope Urban IV issued the Papal Bull, “Transiturus de hoc Mundo”, in which Corpus Christi was made a feast throughout the entire Latin Rite, universally. This act was inspired by a procession to Orvieto, after a village Priest in Bolsena and his congregation witnessed a Eucharistic Miracle of a bleeding Consecrated Host at Bolsena. This was the first “Papally” imposed universal Feast for the Latin Rite. While the institution of the Eucharist is celebrated on Holy Thursday, the liturgy on that day also commemorates Christ’s New Commandment, “A new commandment I give unto you, That ye love one another; as I have loved you”, John 13:34, venerating the washing of the Disciple’s feet for the institution of the Priesthood, and the agony in the Garden of Gethsemane. For this reason the Feast of Corpus Christi was established to create a feast focused solely on the Holy Eucharist. The celebration and Feast of Corpus Christi, lies at the heart of the Catholic Faith, being blessed and able to receive the Body, Blood, Soul and Divinity of Jesus Christ, through the Sacrament of the Holy Eucharist.